ECU Joondalup continue to build in the local community, and this was given a massive boost last week with the club forming a relationship with Butler based Irene McCormack Catholic College’s Soccer Academy. The College’s Soccer Academy Coordinator Damian Stefanoff said they are looking forward to extending ties between both parties. “ECU Joondalup has been a most professional and successful club in the NPL WA/State League, especially with regards to developing players and providing opportunities for them to be signed by English Premiership and Championship clubs,” he said. “Geographically ECU is the closest senior NPL WA club to our College, and shortage of soccer pitches in the Perth, is an issue in the northern suburbs of Perth, and with the College having excellent full size pitches and a new dual court indoor sports centre, we would be pleased to consider ECU Joondalup access to our pitches, especially in the pre-season. ECU’s Football Operations Manager Steve Amphlett said it’s a great partnership as the club head in to their 25th anniversary. “We are looking to form a relationship with Damian and the Irene McCormack College, which will initially start with ECU providing qualified coaches to coach some teams and manage when they play,” Amphlett said. Stefanoff said after speaking to the club the decision to form a relationship was a simple one, with the club also having worked with the University in the past. “The College has worked with the Edith Cowan University’s Sport Science, Soccer staff for many years, participating in their Work Hard, Play Hard program and engaging in fitness testing analysis with their students. It has been an excellent learning opportunity for our students to experience the ECU Sports Science Soccer course, with the possibility our academy students consider this path after College graduation,” he said. The Irene McCormack Catholic College Soccer Academy is about to enter its sixth year, and their aim is to develop all aspects of the player’s ability and knowledge. The fundamentals for development are the four key skills with the ball, especially their first touch, as well as their perception, decision and execution skills. The program includes practical and theory lessons. In years 7 and 8, the students engage in the Skill Acquisition Phase of the FFA Curriculum. Years 9 and 10 students develop through the Game Training program and with incorporating aspects of successful clubs and nations, such as the small sided game approach and futsal. The Years 11 and 12 Soccer Academy students complete a Certificate II in Sport & Recreation. Students complete a Level 4 in Refereeing and gain coaching qualifications. There students graduate from the College Soccer Academy with a significant level of soccer knowledge and experience training, to enable them contribute to their clubs and have the opportunity to develop a career in Soccer as a player, coach or administrator. The School have a number of ECU junior players in their ranks and Stefanoff said they have some outstanding players in their program. 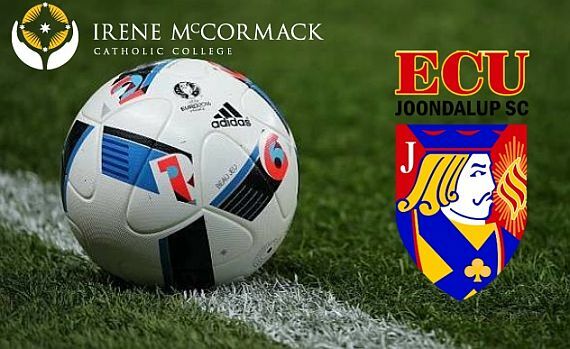 “Irene McCormack Catholic College has talented players in our academy, with several of them playing for ECU Joondalup SC,” he said. “We have many students that play for Perth Glory, notably Chok Dau (Year 12, 2017). Welcome on board to Damian and the Irene McCormack Catholic College, we are looking forward to a strong partnership in the future.